New! Catch It and Cook It Book! 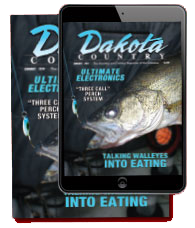 The talented staff at Dakota Country Magazine just compiled a new book for today’s angler, with 150 fishing tips, over 50 special cooking tips and 46 of our favorite fish recipes from Dell Hankey. 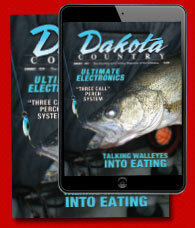 Contributers to this great new publication include fishing tips by Jason Mitchell, Bill Mitzel and yours truly, with cooking recipe contributions from our own favorite, Dell Hankey, Bryce Risser and Lyle Gallagher. The booklet is receiving high praise and demand is already exceeding our expectations. The special Dakota Country Magazine publication was possible through the contributions of some of the most passionate outdoors people in the Dakotas. We are grateful to them for their willingness to share their knowledge of the fruits of the northern plains. For a copy of the new Catch It and Cook It book contact our headquarters in Bismarck at (800) 767-5082, or locally 255-3031. Subscribe to DC Magazine today and WIN!